Figure 7.10 Diagrams showing the stratigraphic relationship of the fern-spore spike to the boundary claystone layer and coal beds at three localities in the Raton Basin. a - City of Raton, b - Starkville South, c - Sugarite (modified from Nichols and Fleming 1990). Reprinted by permission. from clastics to coal or (as at Pyramid Butte in the Williston Basin) from coal to clastics. Comparison of the lithology and palynology of the Starkville South, Sugarite, and City of Raton localities shows that the palynological changes are independent of lithological changes. The relations of the palynological extinction level and fern-spore spike to lithology at these three key Raton Basin localities are shown in Figure 7.10. Biostratigraphically important species of the Raton Basin palynoflora are illustrated in Figure 7.11. The most common species in Maastrichtian samples belong to the genus Tschudypollis (Figure 7.11a). Stratigraphically restricted to the Maastrichtian and present in many samples from the Raton Basin are "Tilia" wodehousei (Figure 7.11b) and Trisectoris costatus (Figure 7.11e). Species in common with the Maastrichtian of the Williston Basin (along with Tschudypollis spp.) are Liliacidites complexus (Figure 7.11c) and Libopollis jarzenii (Figure 7.11d). Aquilapollenites mtchedlishvilii (Figure 7.11f), which is known to many authors as A. reticulatus, is exceedingly rare in the Raton palynoflora, as are all species of the genus. The scarcity or absence of species of Aquilapollenites and the presence of species geographically more typical of the Raton Basin illustrates that the palynofloristic composition of uppermost Maastrichtian assemblages varies with latitude in western North America, a fact documented by Nichols and Sweet (1993). Figure 7.11h is the epiphyllous fungal thallus Trichopeltinites sp., which disappears at the K-T boundary, presumably along with the megafloral species that was its host. Also illustrated are Cyathidites spores (Figure 7.11g) from a fern-spore spike assemblage of earliest Paleocene age. 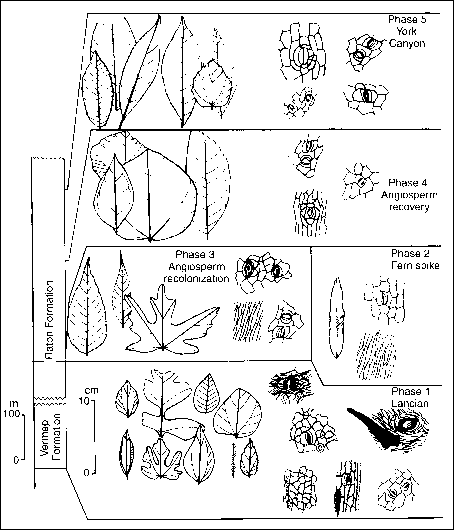 Figure 7.11 Representatives of the Raton Basin palynoflora. a - Tschudypollis retusus, b - "Tilia" wodehousei, c - Liliacidites complexus, d - Libopollisjarzenii, e - Trisectoris costatus (partial specimen), f - Aquilapollenites mtchedlishvilii, g - Cyathidites diaphana (several specimens in fern-spore spike), h - Trichopeltinites sp. Figure 7.12 Phases in megafloral physiognomy in the Raton Basin from Maastrichtian to Paleocene time (from Wolfe and Upchurch 1987a). Reprinted by permission. in leaf physiognomy from late Maastrichtian to early Paleocene time (Figure 7.12). Phase 1 (latest Maastrichtian) of Wolfe and Upchurch (1987a) is characterized by a megaflora of high diversity that grew in a warm, sub-humid climate. This megaflora is represented by 47 species collected from six localities, 43% of which are dicots. Phase 2 is equivalent to the fern-spore spike interval, just above the K-T boundary; it includes only two megafloral species from three localities: fern fronds and rare specimens of a bryophyte. Phase 3 is the angios-perm recolonization based on eight species from five localities, five of which are dicots. Phase 4 is called angiosperm recovery because more angiosperms appear in the megaflora, 25 species from 14 localities, 21 of which are dicots. 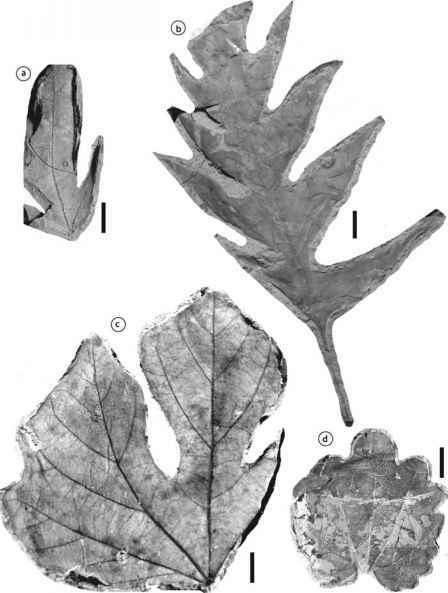 Phase 5 includes 35 species from 20 localities in the vicinity of the York Canyon mine, 27% of which are dicots and many of which exhibit rainforest physiognomy in the form of large leaves and drip tips. 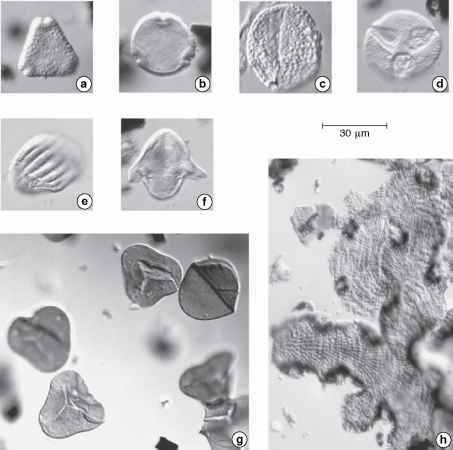 Phases 3 and 4 are associated with pollen of Paleocene palynostratigraphic zones P1 and P2 (Nichols 2003). Phase 5 megafossils are associated with Paleocene palynostratigraphic Zone P3, which is also found associated with high-diversity megafloral rainforest sites in the Denver Basin (Johnson and Ellis 2002). This will be discussed further in the section on the Denver Basin, but the Raton Basin was the first place where possible rainforest floras were discovered within a few million years after the K-T boundary event. A pattern of increasing diversity in the megaflora preserved in successively higher stratigraphic levels within the Paleocene is evident from these data. However, we note that diversity increases in direct proportion to the number of localities sampled, and Wolfe and Upchurch did not report the number of specimens used in their analyses. Since diversity increases with sample size, this is a significant problem. Based on this observation, the small number of Cretaceous localities in this study probably underestimated the amount of extinction at the K-T boundary. Upchurch (personal communication 2000) reported that he and Wolfe had personally collected specimens at only two of their six Cretaceous localities, and that data for the other four were derived from analyses of the Lee and Knowlton (1917) collections, some of which included specimens from the underlying Vermejo Formation. Despite the small sample of Cretaceous megafossils, the pattern of extinction was strong. What was not clear from the data was the nature of megafloral change within the Late Cretaceous, simply because Wolfe and Upchurch (1987a) did not have adequate stratigraphic density of samples on which to base such statements. As shown in Figure 7.12, Wolfe and Upchurch (1987a) reported summary data from analysis of dispersed leaf cuticles from palynological preparations in support of their five-phase pattern of megafloral extinction, survival, and recovery. While rich in promise, this cuticular work was never followed by detailed monographic work, so it is difficult to evaluate. Figure 7.13 Geologic map of the Denver Basin with K - T boundary model. Shown are two cored wells (localities 57 and 58), two well-characterized K - T boundary surface outcrops (localities 56 and 59), and three poorly characterized K - T boundary surface outcrops (A - Florida and Kipling locality, B - Cottonwood Creek locality, and C - Jimmy Camp Creek locality). The modeled K - T boundary line was developed in a geographic information system (GIS) by creating a K - T boundary plane that passed through the two subsurface well points and four of the five surface points. This plane was intersected with a digital elevation model (DEM) of the Denver Basin. The dotted line on the map represents this intersection. We tested the model by sampling palynological and megafloral localities on either side of the projected K - T boundary at Cottonwood Creek (B) and found it to be correct within 70 feet at that location. American West, Upper Cretaceous and Paleocene fossil plants have been known from the Denver Basin since the 1860s and these fossils were a major part of the Laramie Problem discussed in Section 4.2. Large compilations of these floras were provided by Knowlton (1922,1930) and Brown (1943,1962), but discontinuous surface outcrop made temporal sequencing of the floras difficult. Figure 7.14 Cross section of the Denver Basin (vertical scale exaggerated) showing stratigraphic nomenclature for Maastrichtian, Paleocene, and lower Eocene strata in the Denver Basin. D1 and D2 sequence terminology after Raynolds (2002). Note that alluvial fan deposits are present on the west side of the basin while lignite deposits are present to the east. Also shown are positions of the Castle Pines and Kiowa core holes with magnetostratigraphic data from each. Palynostratigraphic zones identified in each core are indicated: E = lower Eocene zone; P1, P2, and P3 = Paleocene zones; WsAZ = Wodehouseia spinata Assemblage Zone (Maastrichtian); AslZ = Aquilapollenites striatus Interval Zone (Maastrichtian). Figure 7.15 Photograph of the South Table Mountain locality near Golden, Colorado. The top of the butte is capped with Paleocene basalt flows. The group of people is located in a basal Paleocene channel that produces Puercan mammals and Paleocene leaves. The K-T boundary is poorly constrained at this site but is roughly 5-10 m below the lowest person. beds (Obradovich 2002; Hicks et al. 2003) and by magnetostratigraphy (Hicks et al. 2003). Also, the basin contains a rich paleontological record from vertebrate paleontology, paleobotany, and palynology (papers cited in Johnson et al. 2003 and Raynolds and Johnson 2003). The earliest resolution of the K-T boundary in the Denver Basin is that of Brown (1943, 1962). In a prescient study using the vertebrate paleontological and paleobotanical records, Brown produced a map that traced the approximate position of the boundary around the basin margin. He could not rely on a lithologic change across the boundary, as is possible to some extent in the Williston Basin, because the rocks of the K-T transition in the Denver Basin are from similar depositional environments and are extremely poorly exposed. Brown's best outcrop was on the southeast corner of South Table Mountain, near Golden, Colorado (Figure 7.15). 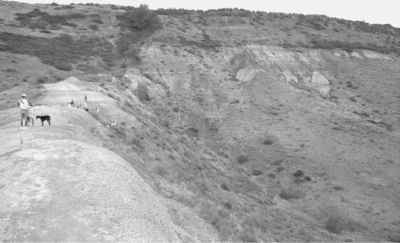 There he collected Paleocene megaflora in association with Paleocene mammals at a site roughly 20 m above Cretaceous Triceratops bones. This was arguably the first terrestrial K-T boundary section known from terrestrial rocks and was significant in resolving the stratigraphic issues of the Laramie Problem. South Table Mountain (locality 56) was also the setting for an early palynolo-gical study by Newman (1979). 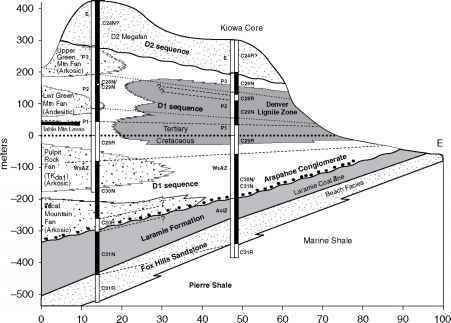 Because the locality is near the western edge of the basin, coarse lithologies not amenable to palynological study preclude the close spacing of samples required to determine the precise position of the K-T boundary. Newman identified characteristic Maastrichtian and Paleocene pollen in widely spaced samples and chose the approximate position of the boundary about 14 m lower than Brown had estimated its position. Kauffman et al. (1990) revisited the South Table Mountain locality and collected new samples for palynology and paleobotany. They narrowed the gap bracketing the K-T boundary to within a 4.9-m interval, 7-12 m below Brown's estimate and 2-7 m above Newman's. No boundary claystone layer is identifiable within this interval due to the presence of coarse sandstone. Despite the quest having begun so early, precise placement of the K-T boundary in the Denver Basin remained elusive for almost 60 years. Since 1999, two iridium-bearing K-T boundary localities have been discovered in the Denver Basin, one in a drill core and one in outcrop. The boundary is bracketed but not pinpointed at three other localities (A, B, and C in Figure 7.13). 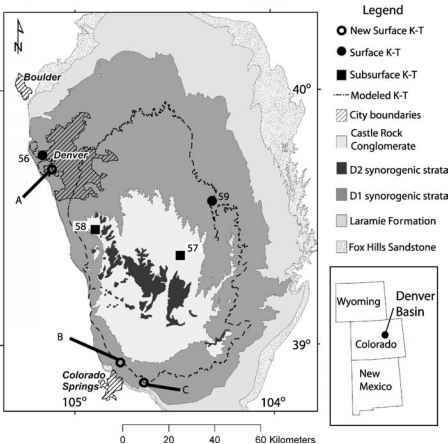 In 1999, under the direction of the Denver Museum of Nature and Science, a 688-m core was drilled in the axis of the basin, near the town of Kiowa, Colorado (locality 57); see Figure 7.13. The well was spudded in the Eocene part of synorogenic sequence D2 (part of the Dawson Arkose) and penetrated the entire sequence of nonmarine basin-fill to the Cretaceous marine Pierre Shale below (Raynolds and Johnson 2002); see Figure 7.14. Hundreds of fine-grained rock samples were collected for palynological and paleomagnetic analyses. The Kiowa Core and the Castle Pines Core (locality 58), which was drilled 35 km to the west in 1987, each preserve a palynostratigraphy that includes the Campanian-Maastrichtian Aquilapollenites striatus Interval Zone, the Maastrichtian Wodehouseia spinata Assemblage Zone, and lower Paleocene zones P1 to P3 (Figure 7.16), a span of about 6 Ma (Nichols and Fleming 2002). The Laramide Orogeny was under way in the Denver Basin at K-T boundary time, which caused uplift and erosion of Cretaceous strata along the basin margin. In the early Paleocene, palynomorphs eroded from the older rocks were redeposited in the basin contemporaneously with Paleocene palyno-morphs. The presence of the Cretaceous palynomorphs in Paleocene sediments constituted a significant challenge to identifying the K-T boundary using only palynology. Finally it became clear that the co-occurrence of Cretaceous marine dinoflagellates and Cretaceous species of pollen and spores could be used as evidence of reworking, and all reworked species could be disregarded. Combining this with data on first occurrences of Paleocene pollen, the palyno-logical K-T boundary was located at a depth of 302.93 (± 0.015) m in the Kiowa Core, within the lower part of unit D1; Figure 7.16 (Nichols and Fleming 2002).